Live Spot prices are available. A log in is required: please contact your WOCU sales representative or email sales@wocu.com to arrange. 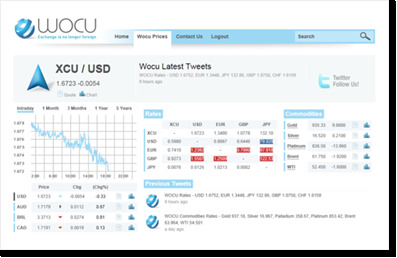 The WOCU is available on IDC PrimePortal, TraderMade pro charting systems and is available via Thomson Reuters data feed and terminal applications. 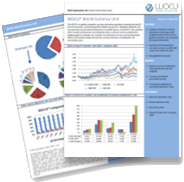 The WOCU Reference Data Service provides subscribers with access to the daily reference prices calculated and published by WOCU Limited. The reference prices can be used to define settlement prices for contracts denominated in WOCU. Daily Fixing Spot Rates – a daily rate fixed at 16:00 UTC each weekday for WOCU against four major currencies – USD, EUR, GBP and JPY. Reference Spot Rates – hourly rates, from 00:00 to 23:00 UTC, generated each weekday for WOCU against USD, EUR, GBP and JPY. Delivery Methods – Several delivery methods are supported – eMail, FTP Pull and FTP Push – providing subscribers with access to the reference data sets. 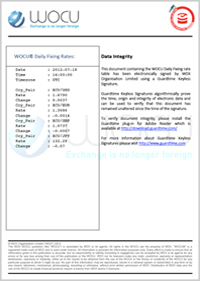 To subscribe to the WOCU Reference Data Service please contact your WOCU sales representative or email sales@wocu.com . Subscribers may request reference rates for historical periods by contacting your WOCU sales representative or e-mail sales@wocu.com.